We all know OCR (Optical Character recognition) software that can be used to read words from images and convert them to editable text. ABBYY is a world leader in Optical character detection technologies. Their desktop software is well known for accurate conversion of images to editable document formats. They also have a mobile based OCR software called ABBYY FotoTranslate, which could be a valuable tool for frequent travelers. The ABBYY FotoTranslate can make use of the camera in a mobile device to take pictures of text in different foreign languages, and can convert them to a desired language. 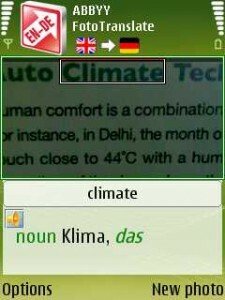 This application currently supports Symbian Nokia smartphones. The use of a mobile OCR software is limited to certain purposes. However, it is useful for a person traveling from one country to another country. They can take photos of text in sign boards, directions, menus, etc. and get them converted to their language, using mobile phones. ABBYY FotoTranslate supports 8 major languages in 28 different version. We have tested English to German version of ABBYY FotoTranslate. 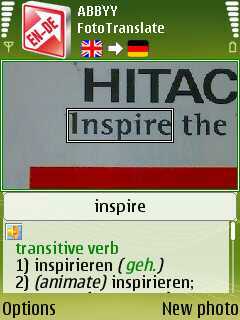 We used the main camera in our Nokia phone to take photos of a Hitachi AC brochure. ABBYY FotoTranslate opens the mobile camera in its interface. We can adjust the camera orientation, flash, etc. to take the best picture of the area from which the text is to be extracted. The image will be then processed and displayed as shown above. The joystick or navigation key can be used to navigate through different words. Corresponding translation of words will be shown in real-time at the bottom side of image. As you can see from above screenshots, ABBYY FotoTranslate is pretty much accurate in detecting characters from photos. It has a large database of words, so you don’t need to connect internet for translation. The full version of the application is available for download at the official website for just 7.99USD. You can also download a trial version to test the application performance.